It’s that time again. September 2 (only 2 weeks away) Houchin Blood bank in Bakersfield will be hosting another blood drive at the Mojave Air & Space Port. Appointments are every ten minutes between 8:30 am and 3:30 pm. Kern County is in desperate need for blood donors right now, so please take a few minutes out of your day to help save a life. Everybody who donates will be entered to win a $500 gift card to the Valley Plaza Mall in Bakersfield! 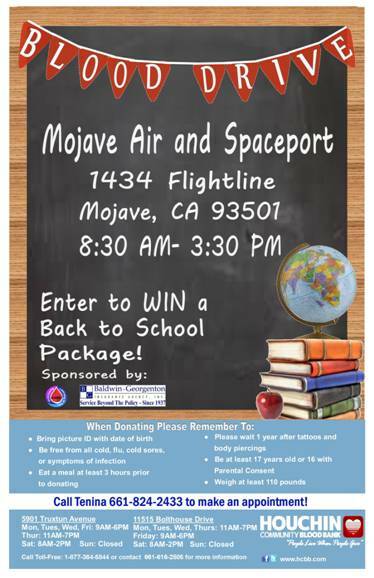 If you are interested in donating please call or email Tenina at 661-824-2433 or Tenina@MojaveAirport.com. She will schedule you for an appointment or add you to the walk-in list. If you are unable to donate, please pass this information on to somebody who may be interested and willing. This entry was posted in Community events, Houchin Blood Bank, Kern County, Mojave CA on August 19, 2014 by mojavefoundation.